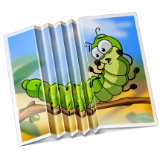 iResizer helps to resize images without destructing or cutting the content. It can scale a photo without changing its main visual content: people, buildings, animals and other objects. Unlike other resizing programs, which affect all pixels while scaling a picture, Intelligent Resizer affects pixels in areas that do not have important visual content. Intelligent Resizer also allows you to “fix” the aspect ratio of a photo. It folds the image so that it will still look natural and will retain the quality, integrity and spirit of the original. In order to preserve important objects you simply select them and run the resizing, the rest is done automatically. Moreover, Intelligent Resizer can change the spacing between main objects as well as remove objects from image like you’d fold a paper photo. Creating square images for Instagram without cropping is also possible with the app!